The Minister of Transportation, Rotimi Amaechi, has called for the support of United Nations and stakeholders to make stringent punishments for road offenders in the country. Safety and Traffic Injury Prevention Nigeria paid him a visit to Abuja. He said that if there were stiffer punishments like going to jail for offenders of the law, then road users, especially politicians, would obey the traffic laws. According to him, the UN should start its advocacy from the State parliament, judiciary and police for enforcement as this will limit the freedom of road users and instill discipline. "The problem of road safety in Africa, not only in Nigeria, is basically the problem of consequences for action; if every human being can be discipline itself or herself, then there will not be need for parliament." "The reason there is a parliament is because it should be governed; the judiciary and police are there for the consequences of disobeying that law. "So, if you are doing advocacy, do not tell people to drink and drive, they will spend two months in prison, they will not drink and drive. When you finish with the parliament you go to the jail, no politician wants to go to jail. 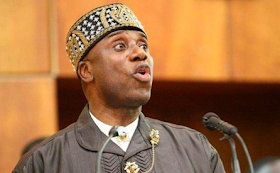 China, whose population is higher than Nigeria is more organized in obeying traffic regulation, '' Amaechi said.